In this bestselling true story, one Honduran boy goes in search of his mother, who left to find work in the United States ten years ago—when he was just seven years old. This is the true and heartbreaking story of sixteen-year-old Enrique, who sets off on a journey alone to find his mother, who he has not seen for eleven years, not since she left her starving family and illegally entered the United States, hoping to make enough money to send home to Honduras. With little more in his pocket than a slip of paper bearing his mother’s phone number, Enrique embarks on a treacherous odyssey, traveling by clinging to the sides and tops of freight trains. Even when confronted by bandits, thugs, and corrupt cops, he is determined to complete his journey, often buoyed by the kindness of strangers or simply by luck finding water or food. In the face of this hostile world, Enrique’s love for his mother and his desire to be reunited with her endure and triumph. Enrique’s journey tells the larger story of undocumented Latin American migrants in the United States. His is an inspiring and timeless tale about the meaning of family and fortitude that brings to light the daily struggles of migrants, legal and otherwise, and the complicated choices they face. 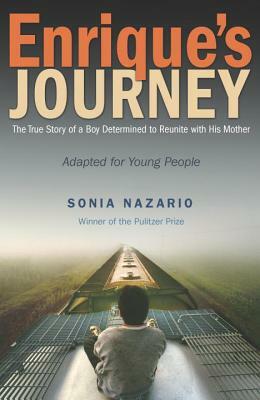 The issues seamlessly interwoven into this gripping nonfiction work for young people, based on the adult phenomenon Enrique's Journey: The Story of a Boy's Dangerous Odyssey to Reunite with His Mother and the Pulitzer Price-winning Los Angeles Times newspaper series that inspired it, are perfect for common core usage and for discussions of current events. Includes an 8-page photo insert, as well as an epilogue that describes what has happened to Enrique and his family since the adult edition was published. SONIA NAZARIO was a projects reporter for the Los Angeles Times. She has spent more than two decades reporting and writing about social issues. She won the Pulitzer Prize for her work on the Los Angeles Times series that served as the basis for the adult edition of Enrique's Journey. Sonia Nazario lives in Los Angeles with her husband.